All transactions are safe and secure with a reliable history in online purchasing behind each of our associates. 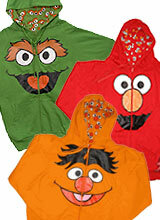 Buy the Sesame Street Character hoodies to own Sesame Street clothing and merchandise. When you're up sweeping the clouds away on your way to where the air is sweet, you might find yourself getting a bit chilly. Remedy the situation with a Sesame Street hoodie. Choose from among some of the most memorable characters, including Bert and Oscar the Grouch. The Sesame Street TV show was designed around the principle that if you can hold the attention of children, then you can educate them. Through fun characters like the ones on these Sesame Street sweatshirts, that theory proved to be true. Outfit yourself in the reversible Oscar the Grouch hoodie shown on the left. In addition to the Sesame Street Character hoodies above, browse the Sesame Street Clothing Gallery for more apparel like men's and women's clothes, kids shirts or hoodies.